Google AdSense revenue flat - what does it mean? Google just released earnings. As usual, search advertising showed strong growth year-over-year as well as sequentially. Things were not nearly so good for AdSense. Google’s partner sites generated revenues, through AdSense programs, of $1.69 billion, or 30% of total revenues, in the fourth quarter of 2008. This represents a 4% increase over fourth quarter 2007 network revenues of $1.64 billion and a 1% increase over third quarter 2008 network revenues of $1.68 billion. Only 1% over the previous quarter? That seems pretty light for Google. But look at the chart below (courtesy of HowToNotMakeMoneyOnline.com). AdSense revenue has not been growing significantly since the end of 2007. Yet it is also clear that AdSense makes up a big chunk of Google revenue: 30% as of the most recent quarter. So what has caused AdSense revenue to stagnate? Certainly there is no lack of opportunity. With the continued proliferation of blogs and web sites that are willing to host AdSense ads, the inventory of ad slots keeps increasing. Furthermore, Google has mentioned in its most recent conference call that as some advertisers reduce their ad buys in the current tough economy, those ad slots on affected web sites are willing to accept AdSense ads. Aggregate paid clicks, which include clicks related to ads served on Google sites and the sites of our AdSense partners, increased approximately 18% over the fourth quarter of 2007 and increased approximately 10% over the third quarter of 2008. So it seems like the number of clicks is not the problem. That leads us to how much money Google is making per click. This is composed of two parts: there is what Google gets from the advertiser and what Google pays to the publisher or owner of the web site hosting the ads. The payout to the publishers is known as Traffic Acquisition Cost or TAC. Google keeps the difference. This amount has also stayed the same for the last year. You can see it as the red area in the chart above. That implies that what advertisers have been willing to pay for keyword-based advertising like AdSense has been stagnant or declining. This is in contrast to the keyword inflation that has been seen in AdWords, at least before the economic downturn got into full swing. The reason may be due to the maturity of the AdSense product. Many of the biggest, most popular sites don't run AdSense. They work with ad networks and run text ads, display ads and affiliate-style ads. Some bloggers advise that getting rid of AdSense is necessary to convince visitors the site is run by professionals. There is a movement toward cost-per-action (CPA) advertising where publishers are paid not merely for clicks but for buyers actually taking an action on the advertiser's site - buying a product, signing up for a demo or a newsletter, etc. "Smart pricing" is a Google process that has been discussed in SEO circles. This is an attempt by Google to acknowledge differences in traffic quality and to begin to accommodate the CPA concept. Google describes smart pricing this way: "Google's smart pricing feature automatically adjusts the cost of a keyword-targeted content click based on its effectiveness compared to a search click. So if our data shows that a click from a content page is less likely to turn into actionable business results -- such as online sales, registrations, phone calls, or newsletter signups -- we reduce the price you pay for that click." 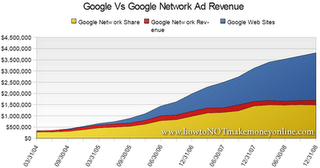 So it appears that Google's own systems may be helping reduce AdSense revenue. The contention that AdSense doesn't provide the best traffic for advertisers may indeed be true. Acquiring more ad slots on higher quality web sites may help but when the economy improves, will those sites keep AdSense or go back to accepting more lucrative ads from higher quality, higher paying advertisers? AdSense may only see a temporary bump and then go back to its current flat level of revenues. Luckily, that is still a pretty good chunk of change. In terms of growth, though, it's a good thing search ad revenues are still increasing strongly for Google. My apologies! The link has been corrected.